Schmoopie Pumpkin: Daddy, what's on my toe? Me: I don't know, sweety, is it a sticker? Me: Its not? It looks a lot like a sticker. Me: Hrm, is it an ostrich? Me: Well, I guess that's good. Is it a German Panzer tank? Me: Is it Estes Kefauver? Me: Is it a sticker? 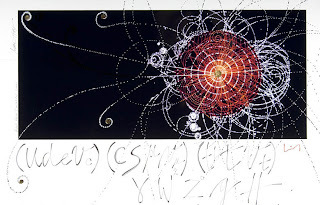 Me: Wait ... a... minute.... Is that a Higgs Boson!?!? Me: Wow, I was expecting more fanfare when we finally found it. As it is, I think you pooped.